Jan. 26 Update: NSF announces fifth grant, $1.2 million, for Dr. Pasha Antonenko to lead UF team on 3-D paleontology technology project. Dr. Pasha Antonenko in his Norman Hall office. GAINESVILLE, Fla. — Pasha Antonenko, an associate professor of educational technology, has set a new standard at the University of Florida College of Education, scoring five research grants from the National Science Foundation — all in the same 2015 funding cycle. Thomasenia Adams, associate dean of educational research, said five NSF awards sets a single season record for grants awarded to a College of Education faculty researcher. “Dr. Antonenko has blazed the trail we have not seen before,” Adams said. The National Science Foundation is an independent federal agency, created by Congress in 1950, that funds nearly one-fourth of all basic research conducted by America’s colleges and universities. It’s the only federal agency that supports all fields of fundamental science and engineering, except for the medical sciences. Even more impressive than the number of NSF grants Antonenko received may be the variety and importance of the topics to be addressed in the resulting studies. Antonenko’s five NSF awards total $4.1 million and will fund novel research projects using a wide-range of technologies in learning applications, including 3-D scanners and printers to study prehistoric bones, drones to study construction projects, and computerized simulations to study the human body’s reactions to a wide-range of stimuli. 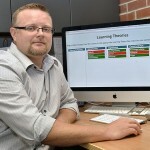 He specializes in exploring the promise and problems of educational technology, including human-computer interaction and the design of learning environments. The Ukrainian-born scholar will work with dozens of collaborators across the country, including researchers from fields as varied as construction engineering and paleontology and from institutions from Arizona to Massachusetts, as well as the University of Florida. Antonenko is principal investigator on three of the NSF grants and co-principal investigator on two, one of which is led by UF’s David Julian, associate professor of biology, and the other by Emily Sessa, UF assistant professor of biology. Below is a rundown of the NSF projects Antonenko will be working on. • Creating an evolutionary history of earth’s oldest plants: a $1.8 million, four-year project. With Sessa as principal investigator, the research team is developing a history of the evolution of flagellate plants — the oldest known land-based fauna to ever have existed, such as ferns. Other co-principal investigators are UF biology scholars Gordon Burleigh, Stuart McDaniel and Christine Davis. 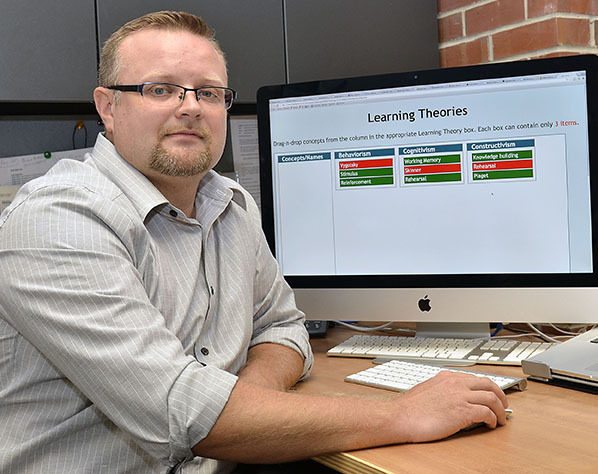 Antonenko’s role is to lead the development of an online application, named Voyager, to allow university students to explore a massive database in classrooms and promote evidence-based teaching practices. Antonenko will measure the effectiveness of the learning by conducting tests, including using electroencephalograms (EEGs), which measure the electrical activity in the brain of students to determine how well they are learning. • STEM teaching using 3-D scanners and printers: This three-year, $1.2 million project will allow middle- and high-school students to study and scan bones in three dimensions, and upload them to virtual collections that scientists can access worldwide and reproduce using 3-D printers. Antonenko said the team is seeking to address an ongoing problem in 21st century education: how to integrate STEM (science, technology, engineering and math) lessons across multiple disciplines. • How community college students learn using multimedia: a three-year,$765,000 effort. The use of multimedia resources in STEM education has undergone remarkable growth in recent years. The problem: Most all research on the effectiveness of these tools has been performed on high-achieving students at elite universities. This study will look at how effective these tools are among more diverse community college students, which now constitute nearly 50 percent of the population of higher education students. Co-principal investigators from UF are education technology faculty researchers Carole Beal (who also heads UF’s new Online Learning Institute) and Kara Dawson, and Andreas Keil, associate professor of psychology. • Creating an application to teach human physiology: a two-year, $247,129 project. Pre-med and other university students studying human physiology will use a new computer-based tool, called HumMod, to find out how a particular variable will affect a person’s health. For example, if a 50-year-old man were exposed to a certain level of carbon monoxide, how would that affect his cardiovascular, respiratory, neural and other processes? This study, led by UF’s Julian, allows for research of more than 6,000 variables to predict physiological responses. • Using drones to study construction and engineering projects: This one-year, $58,148, pilot trial will use drones equipped with video cameras so students can view structures that are under construction. It seeks to address the problem in construction engineering and management courses of how to show students the myriad ways to build increasingly complex projects in a variety of scenarios, such as on all manner of construction sites. It’s not practical for students to take field trips to see these projects. “Cyber-Eye” will allow them to view drone-shot videos and establish a case library to see how to tackle real-world construction issues. With this, as with as all his projects, Antonenko is looking to solve problems by using new ways of teaching and learning. “In essence, all of the projects are about my core research, which really is understanding learning from different perspectives,” he said.